YOUNG athletes from across the borough proved to be sporting superstars at this year’s Specsavers Surrey Youth Games, as Team Woking topped the medal table. 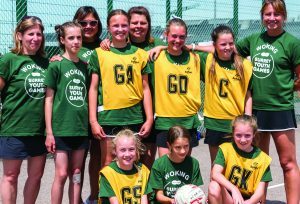 More than 150 children, aged between 7 and 16, represented Woking at the weekend-long event, competing with teams from all the boroughs and districts across Surrey in sports including badminton, boccia, boxing, football, hockey, judo, lacrosse, netball, touch rugby, squash and mini tennis. Team Woking won a total of seven gold, two silver and one bronze medal. However, while competition was still key to each event, the introduction of the inaugural Gerry Ceaser Fair Play Award ensured good sportsmanship was recognised as well. Team Woking issued a grateful thanks to Freedom Leisure, Headline Design and Print and Orange Promotions for their sponsorship.